We carry out all types of car repairs, from small automotive repairs through to full engine repair, electrical repair, rebuilds and modifications. Car repairing is second nature to us. Our technicians regularly attend auto repair courses and are right up to date with the changing trends in auto technology. You save time and money because we are already trained to treat your car's modern ailments. The equipment, tools and diagnostic equipment we use in our repair service are so up to date even NZ's health system could be put to shame. 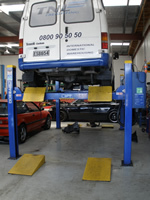 Come to The Best with confidence in our car doctors and enjoy happy motoring. The tools we use for car repair include things such as scan tools, scope and emission testing equipment. If the job turns out to be a bit more than you expected, we'll talk with you first. We have payment plans available. If you need transport while your loved one is hospitalised in our clinic we have courtesy cars available. Also we are proudly an MTA member so you know you're in good hands.